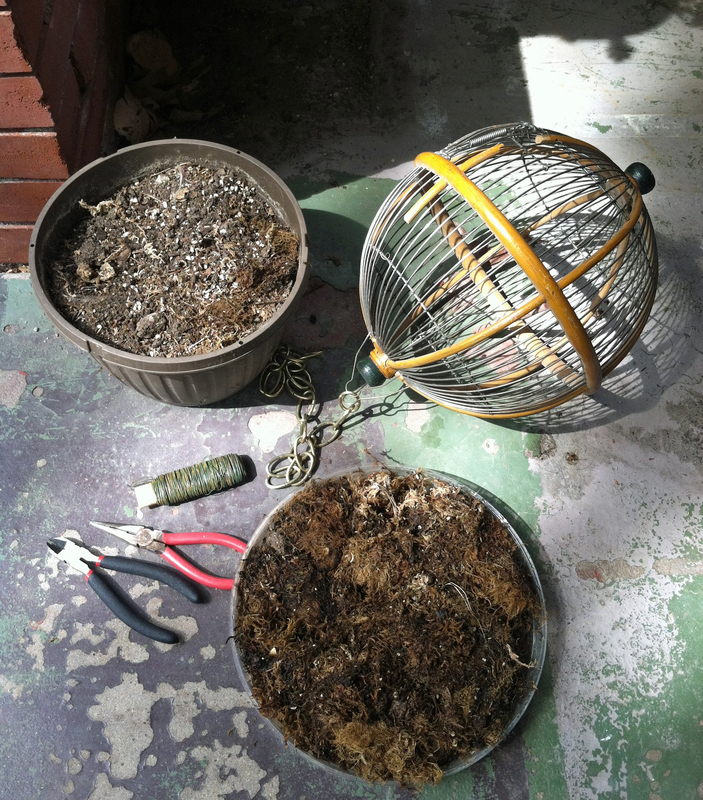 I gathered my materials: Spagnum moss, potting soil, floral wire, needle-nose pliers and wire cutters, gloves, a small but sturdy stick, and of course, succulents. 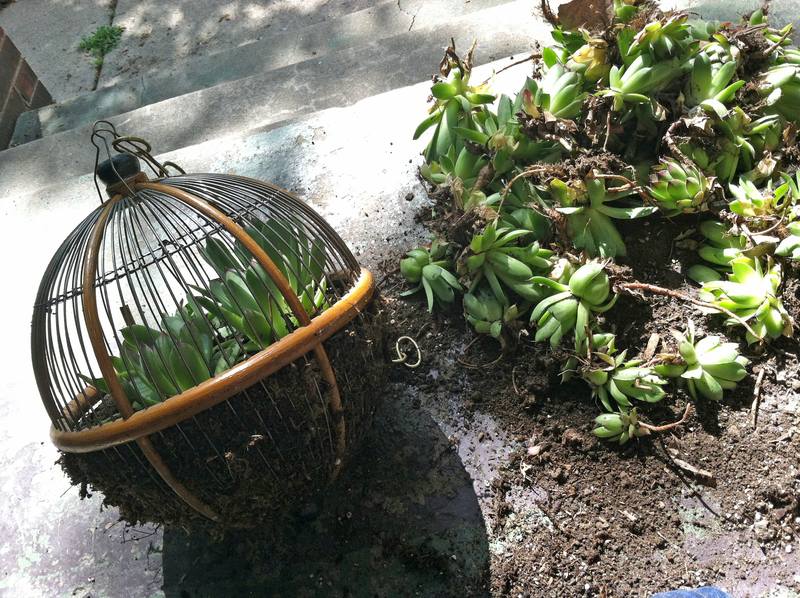 I mixture of succulents would be great, but I have a rock garden area in my front yard where the Chicks N’ Hens needed to be thinned out, so I got all the plants for the ball from my garden. No cost! First I soaked and wrung out the moss. 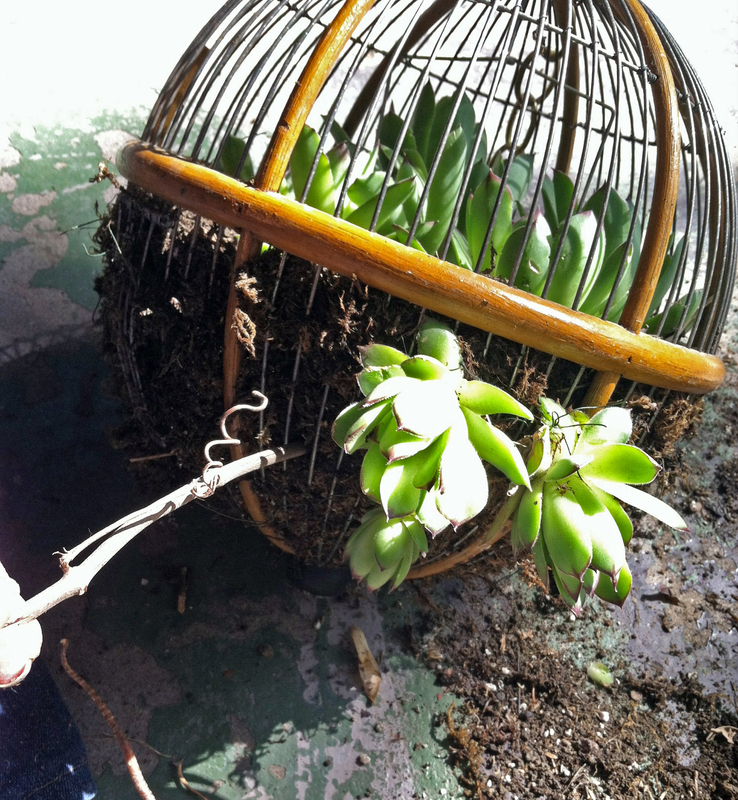 Then, using the little bird door that I could just get my hand through, I put a layer of the damp moss around the inside of the cage, pushing it partly through the wire where I could to keep it in place and reinforced it with twists of floral wire where I couldn’t get it through the side of the cage. Then, I filled it with potting soil and packed it in as best I could. 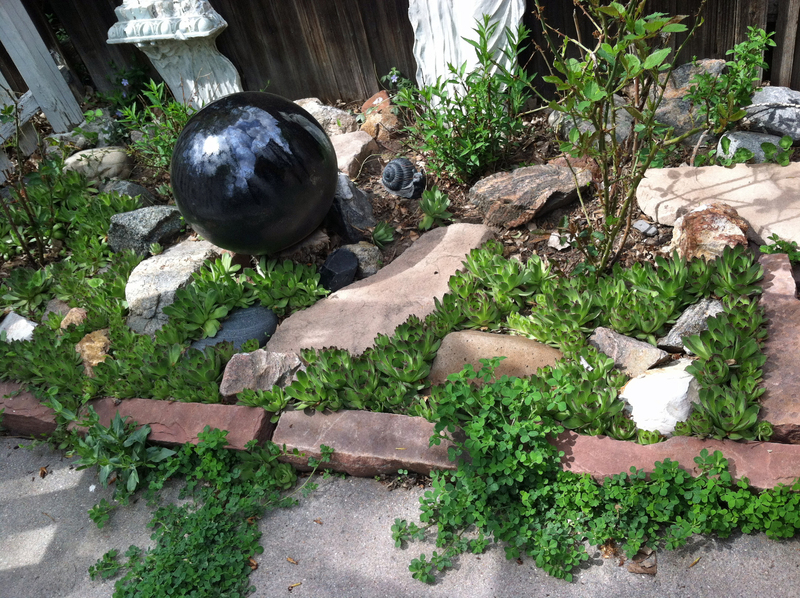 Front yard rock garden area, source of Chicks n Hens. Time to start planting. I started with the inside, and planted a few there. Then the challenging part began. I poked a hole with the stick and pushed the plant root in. Because of the way the wires are on the cage, I had to reinforced many of the plants with a loose twist of the floral wire. I was time-consuming, (and I poked my hands more than once) but it looks good and I dig it. 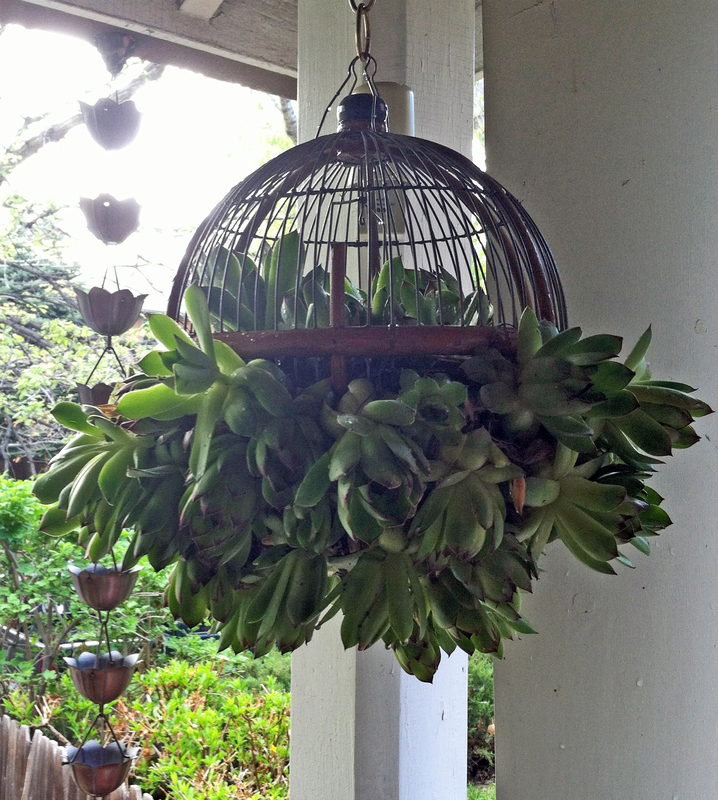 I hung it up and watered it well when I was finished stuffing in the plants. And here it is! 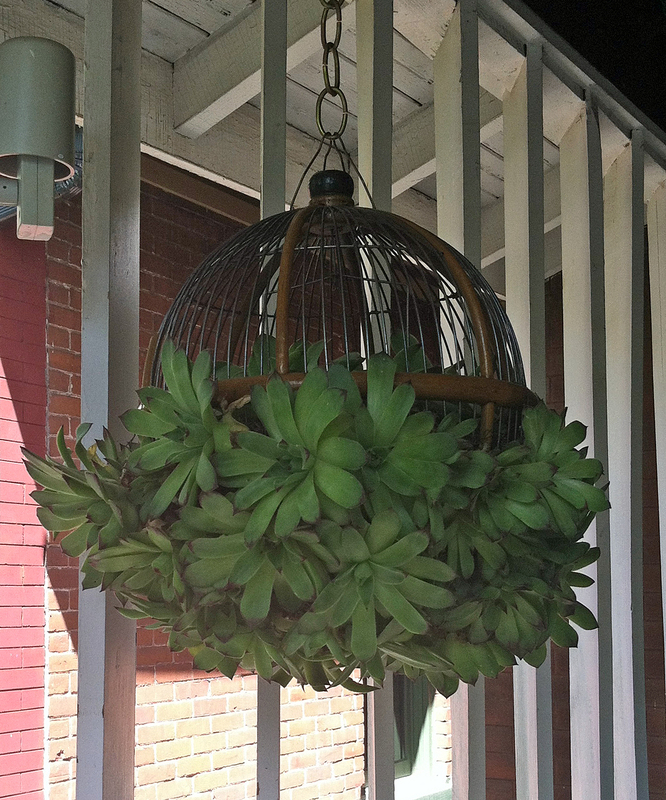 My funky little hanging succulent planter. 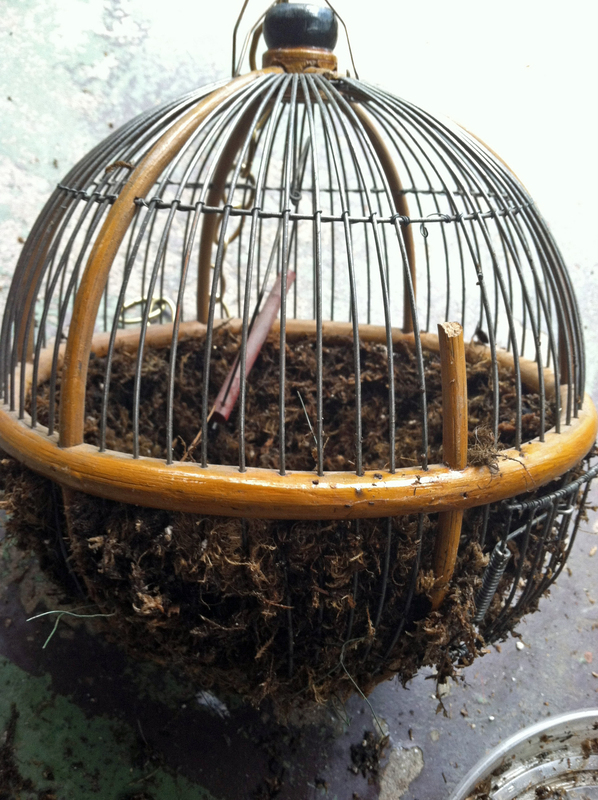 Because I had all the supplies I needed on-hand, it only cost me the 75 cents for the cage (and a couple hours). 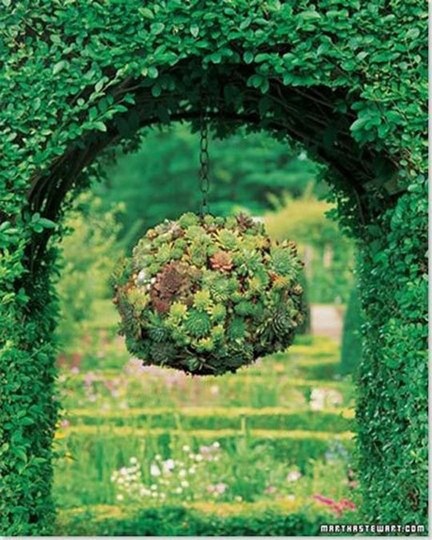 I hope I’ve inspired you to think outside the box and use something interesting in your garden! I’d love to see your garden projects, tell me about them in the comments section. Happy gardening! Succulent Ball, 2 weeks after planting. 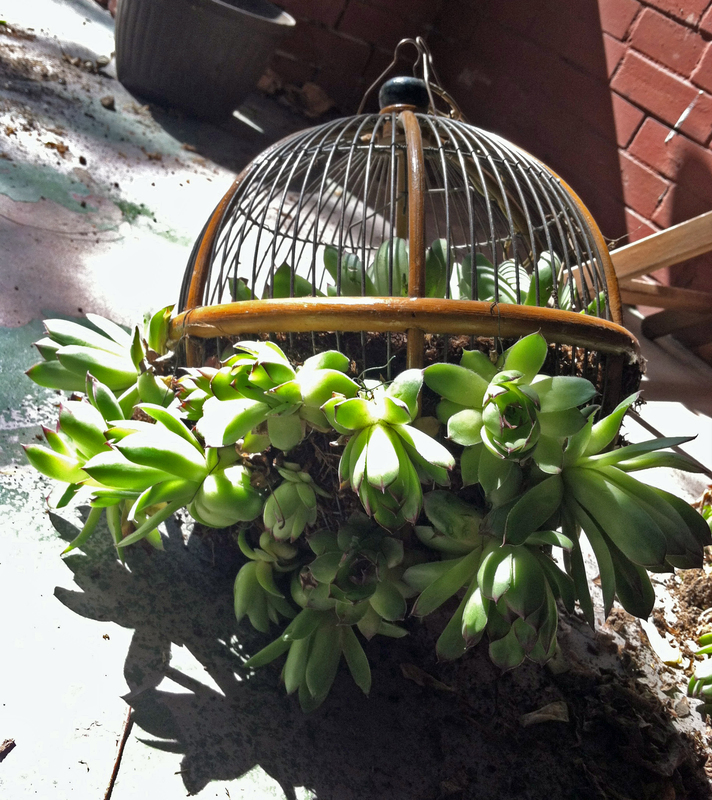 This entry was posted in decorating, DIY, gardening, home, lifestyle, plant care and tagged balcony, budget, chicks and hens, decorating, DIY, fine living, garden, garden inspriation, gardening, hanging plant, hanging succulent ball, lifestyle, outdoor, patio, planting, porch, saving, style, succulent ball, succulents. Bookmark the permalink. ← YARD SALE Season is here! 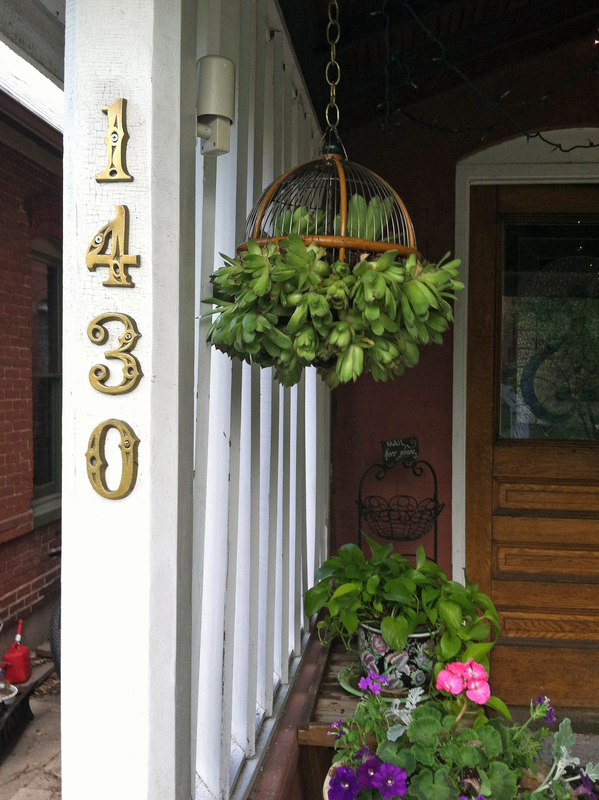 Your How-to Guide to Getting the Best Stuff & Becoming an Expert Garage Sale Shopper.